We offer private, semi-private or class lessons as well as escorted rides and pony rides on a secluded lane. Cross country schooling is also available (weather permitting). 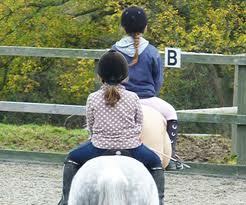 All lessons are held in our indoor school or outside on our all weather arena. Escorted rides take place along the bridleways in the beautiful West Sussex countryside around Arundel. Cross country schooling takes place in our cross country field. We also offer many 'special' activities throughout the year such as Birthday Parties, Group Bookings, Pony Days, Competitions, Shows, Riding & Stable Management Tests and activities for schools. The stables is closed on Mondays for the ponies' day off. Arundel Riding Centre is fortunate to enjoy good access to an extensive network of bridleways. Escorted rides are available for the more experienced rider. Please contact us for more information. * When only 1 or 2 riders attend a Class Lesson it will become a 1/2 hour semi-private lesson. The Cancellation Policy applies to all bookings. A minimum of 24 hours notice must be given of Cancellation. In the event that 24 hours notice is not given the full cost of the lesson will be charged. When 24 hours or more notice of cancellation is given payment will be refunded in full. However please note riders who have paid monthly in advance (and therefore received a discounted rate ) will incur a £2.50 admin charge for a cancellation with 24+ hour notice. A perfect way to celebrate a birthday. An hour packed full of riding and games, tailored for novice riders. Not suitable for complete beginners. A pony party is available on Sunday afternoons either 1pm - 2pm OR 2pm - 3pm. This is for a minimum of 6 ponies and a maximum of 8 ponies. 50% deposit required when booking. Full payment due 2 weeks before the party date. *New activity* Pony grooming party - 1 hour. For a maximum of 8 children, £80 per party. For a smaller party with 5 children or less, £60 per party. 4 years upwards, they also get to have a little ride on a pony - (Including rosettes for each child). It is important that children attend class lessons regularly, this helps them to keep up with the standard of the class as the riders progress. Therefore we only accept riders for under 16 classes who pay a calendar month in advance. Payment is due on the last week of each month. Please provide one months notice if your child is leaving a class. Adult riders who intend to ride each week for a full calendar month can pay for the month in advance and receive a discount rate. Please read information below concerning Cancellation Policy and Riding Attire - Safety & Comfort., This applies to all lessons and escorted rides. Provisional bookings may be made by telephone or in person. Payment MUST be received within 48 hours of the phone call (or visit) to secure the booking. We reserve the right to cancel any phone booking afte 48 hours if no payment has been received. Payments are accepted in cash or by cheque. We are unable to accept credit or debit cards. All riders must wear a riding hat which complies with current legislations. Riders may hire a riding hat for a charge of £1. All riders must wear suitable footwear. If footwear does not have a suitable sole and heel, toe-stoppers will be provided free of charge. We ride in all weathers so please ensure that your clothing is suitable for the weather. Riders that jump on the cross country course must provide and wear a body protector which complies with BETA 200/2009 level 3. Group lessons are one hour classes which normally will take place either in the indoor school. A group can contain a maximum of 8 riders. You will be riding with people of similar ability, age and experience, and taught by one of our qualified instructors. To be eligible for joining a class, the rider must be able to move a horse/pony around the school independently and be in control at all times. Private lessons are available to give you that special one to one tuition. You may book for either half an hour or three quarters of an hour. Semi-private lessons are available for two riders wishing to ride together.